Just as today's maritime industry is currently experiencing technological advances, the equipment that will be used to produce and adhere to these changes must follow the same beat — specifically in the arena of fendering systems. Bellflower, Calif.-based Ure- thane Products Corp. (UPC) has developed a proven system for today's stringent and demanding marine environments. The company has been demonstrat- ing its expertise to a tee with its own foam-filled Marine Guard™ fenders, which offer the utmost protection for ships, harbor craft, docks and piers. Designed to safely absorb the large amount of energy generated by a ship's weight and relative velocity as it approaches a dock, pier or another ship, the fenders comply with all U.S.
Navy and Coast Guard requirements. The fenders are constructed to per- form even under the most trying of conditions; Urethane tailors each fender to the customer's individual needs. Able to absorb up to 40 per- cent more energy than equal sized pneumatic fenders, Marine Guard's higher energy absorption is experi- enced even when subjected to uneven loads or when slightly damaged. Perhaps one of Marine Guard's more significant features is its internal foam core, which is comprised of 100 percent closed-cell, cross linked resilient energy absorbing foam. This non water absorbing foam core, is designed, laminated and constructed to yield maximum strength and con- sistent performance and dependabili- ty levels. On the outside of the fenders lies (the company's own) thick tough protective polyurethane elastomeric skin material, which encapsulates the fenders' foam core. The polyurethane elastomer skin's unique, seamless construction promises to leave vessel hulls free of marks and/or scratches. This specific skin is also reinforced with a woven nylon tire cord, which increases tensile strength and distrib- utes energy and stresses. Pier, Norfolk, Va., where the USS Wisconsin was docked. Nauticus Pier. (Photos: Gene Woolridge, Advertising Visuals, Virginia Beach, Va.) dipped galvanized steel. The purpose of these fittings is to provide a safe and permanent end fitting for the fender and a fixed mounting point for the attachment of optional chain and tire net. This specific design, which is designed not to impede angular and longitudinal compression, eliminates the possibility of fender damage due to end fitting failure. The fenders' end fitting is connect- ed internally with a heavy duty chain, which provides superior pull through strength, increased tensile strength and a distribution of energy and stresses. Type IV A, Grade A, Class 3. Thompson, the ceremony prompted visits by various war veterans — some of whom had served on Wisconsin. Recommissioned in 1988, the vessel is scheduled to begin tours (upper deck only) at its new berth this April. The lower decks are expected to be open to the public sometime within the next couple of years. UPC incorporated three 8 by 18 fit. 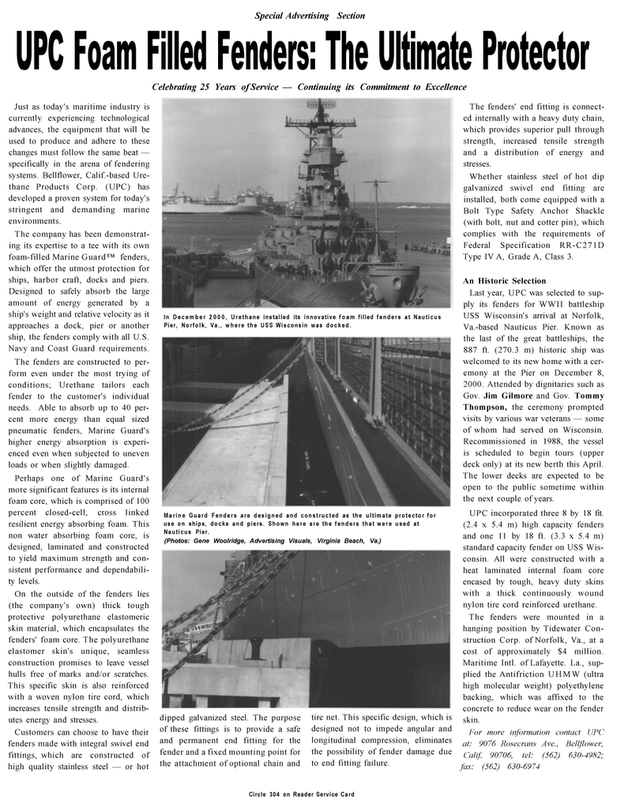 (2.4 x 5.4 m) high capacity fenders and one 11 by 18 ft. (3.3 x 5.4 m) standard capacity fender on USS Wis- consin. All were constructed with a heat laminated internal foam core encased by tough, heavy duty skins with a thick continuously wound nylon tire cord reinforced urethane. The fenders were mounted in a hanging position by Tidewater Con- struction Corp. of Norfolk, Va., at a cost of approximately $4 million. Maritime Intl. of Lafayette. La., sup- plied the Antifriction UHMW (ultra high molecular weight) polyethylene backing, which was affixed to the concrete to reduce wear on the fender skin.